Peter Stiehler (UT Austin) and his wife, Kate Chatfield (UC Berkeley) – both former Jesuit Volunteers and veterans of the Los Angeles Catholic Worker – founded the San Bruno Catholic Worker House (San Mateo County) in 1996 to serve the poor. 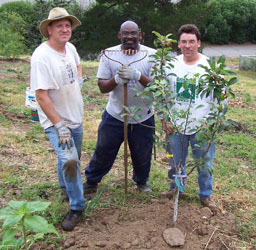 As finances, volunteers and space permitted, service programs were developed and now consist of a daily feeding program, an emergency overnight shelter, shower facilities, long term affordable housing for 10 formerly homeless men, a nursery for habitat restoration for San Bruno Mountain and Peter’s own volunteer community service teaching environmental education and organizing habitat restoration. These excerpts – written by Peter Stiehler – are taken from donor appeal letters, in which he seeks to explain and interpret to friends and supporters the philosophy and practice of the Catholic Worker Movement in San Bruno. How do you treat guests you have invited to your house? Do you prepare for their arrival by cleaning the house and preparing a fine meal, and, upon their arrival, offer them food and drink? Or do you greet them with a trash bag and tell them to clean up around the yard before dinner? This may seem like an odd question, but it’s one we face daily at Catholic Worker Hospitality House. When people come to us requesting food or shelter, should we give unconditionally, without question of worthiness or thought of reciprocity? Or should we require guests to work for their food and shelter? Whether we pose the question ourselves or are asked by our supporters (or those who actively don’t support us), it’s a dilemma we struggle with daily. The demand for reciprocity from our guests is definitely the cultural norm, it’s the logic of workfare and of the 18th century English Work Houses, but it’s not a gospel ethic. A gospel ethic sees the person in need as an ambassador of God, even Christ himself. We are called as Christians not to judge and command, but to treat the person in need as the honored guest. At Catholic Worker Hospitality House we strive to treat all our guests at the dining room and shelter as the honored guest through creating a welcoming place with plenty of good food and drink, and by treating them with dignity and respect. So many of the guests who come to us for assistance are vulnerable, scared and beaten-down. Beyond the fact that we are called to be sources of comfort and compassion to the distressed, it seems to us that it would add insult to injury by demanding work for the assistance we give them. We never demand that our guests assist with set-up or cleaning, however, we do accept offers of assistance. Our experience has been that enough guests will offer to help. We have a regular crew of guests who volunteer to help set-up and clean-up at the dining room and shelter. In fact, over the years all the folks who have worked with us as shelter staff had originally been guests at either the dining room or shelter. But what do you do when the honored guest moves in? When the situation changes from emergency assistance to routine assistance, should expectations also change? At the shelter we gladly give emergency housing (when space is available) to any person in need, but when an extended stay is requested we usually ask they have a plan to change their situation. If they are serious about changing their life situation we will work with them long-term until they are in a position to find and maintain housing. It was because guests were to improve their situation and find work that we started a day labor project to help them find work. It was because we saw disabled guests, unable to work, that we began to assist them to receive government benefits. And it was from working with folks over an extended period of time that we saw clearly the need our guests have for permanent supportive housing, so we began the process of finding and developing that housing. The expectations may change, but the attitude remains the same–treat the stranger as the honored guest by offering generous and gracious hospitality. Abraham showed hospitality to the strangers at his tent and they revealed themselves to be angels. In the end, it matters not if we believe that our guests are angels in disguise or simply an individual in need of comfort–all that matters is how we respond to their presence such that we reveal our humanity. Every human being needs decent, stable housing. Yet for many of the people we serve, housing is either unaffordable or unstable. For years, we watched as our shelter guests would routinely cycle in and out of our shelter with little to no hope of securing any kind of long-term housing. It was especially vexing to see working folks or people receiving Social Security unable to find housing. We felt that with a little support, some of our guests would be able to obtain and maintain long-term housing. Four years ago, we were able to create some housing for our guests. Through a very generous grant from Philanthropic Ventures Foundation, we were able to rent a four bedroom house and start a supportive housing project. While there has been a certain amount of turnover throughout the years, the project has proved successful. Initially, we had to heavily subsidize the rent, but with stable housing the residents were able to work steadily and now pay the full amount of the rent. Those on social security found ways to give back to the community through volunteering. While we no longer need to subsidize the rent, market rate housing is barely affordable for most of our guests as rent takes close to seventy percent of their monthly income, leaving only a few hundred dollars each month (if that) for food, transportation and the like. Most of those we serve at the dining room and shelter are unable to afford this amount of rent. Last year a rent increase by our landlord made the equation even more difficult. What if the landlord raises the rent again? What if we loose the lease? So we have been looking for ways to provide more affordable housing for our guests. Recently Larry Purcell of the Redwood City Catholic Worker approached us about purchasing a house together in order to provide more affordable housing for our guests. Through some very generous donations and judicious saving, the Redwood City Catholic Worker has been able to amass enough money for a sizable down payment on a house. Our plan is for the Redwood City Catholic Worker to make the down payment and for Catholic Worker Hospitality House to pay the monthly mortgage and manage the house. We now have the very achievable goal of finding a house for our guests. Far from fearing rent increases, as we pay down the mortgage the housing can become even more affordable for the residents. 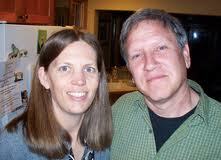 We are actively looking at houses and hope to have an offer accepted in the near future. This summer while working in the backyard of our house on Second Ave. in San Bruno I overheard a back porch conversation between house residents Mike and Wayne. The conversation was facilitated by good-natured teasing back and forth with plenty of laughter. Still, it was just a casual conversation on an uneventful day with the usual banter about the day’s lunch, sports, and the weather. Yet, it was the regular and hearty laughter that caught my attention. On the surface Mike and Wayne don’t seem to have a lot to laugh about. Mike has glaucoma which causes him regular discomfort and severely limits his eyesight, while Wayne is severely disabled from a series of strokes–and both have been repeatedly denied Social Security disability benefits. I put such emphasis on the laughter because it speaks of a sense of normalcy in their living situation and joy in their relationships. Mike and Wayne are clearly at home at the Second Ave. house and they obviously enjoy each other’s company All this expressed in a simple light-hearted conversation. Admittedly, one does not usually think of joy and laughter when considering homeless service projects, but it’s a regular element at Catholic Worker Hospitality House and one we work hard to foster. As the supervisor of two supportive housing units, a homeless shelter, and free dining room, I view these light-hearted conversations as a sort of “canary in the coal mine.” Whether it’s laughter on the back porch, watching television together at the shelter, or simply a casual conversation at the dining room, they are all signs that we are creating a welcoming, accepting environment for those we serve. I feel that if folks are laughing we must be doing something right. It’s hard to underestimate the fundamental importance of creating this safe and respectful environment for our guests. While most of us take these things for granted, for people who are regularly marginalized a safe and welcoming place is gold. All too often we see guests who have built walls to protect themselves from the physical and verbal abuse in their lives. Our challenge at Catholic Worker Hospitality House is to create a place where these walls aren’t needed. The most important thing we do is create a calm and respectful space where folks feel welcomed and safe. That means opening on time with hot coffee, plenty of good food, and clean facilities. It also means not allowing abusive or disruptive behavior from anyone. When appropriate, we try to break the ice with a bit of teasing and joking. A favorite tactic of mine is to greet a guest with a pet name — “Good morning sunshine” or “Hey pumpkin.” After an initial shock, I usually get a smile, and on a good day a “Good morning sweetheart” back. This may all seem like juvenile silliness (of which there is some), but by establishing a rapport with a guest, hopefully a friendship follows which affirms the personhood of the individual and welcomes them into the community. Some may wonder why we emphasize laughter and relationships when those we serve face such serious life issues such as homelessness, chronic medical conditions, or addiction? For me, the answer is that food without companionship might satiate the body, but leaves the soul hungry; and housing without respect and love is not a home. For someone with serious, and probably permanent, health issues laughter and belonging can make their physical condition less onerous. Belonging, laughter and love are the spice of life — without them even a billionaire is poor, with them there is richness in life. Ultimately, what we should be about is love. We need to live love in our own lives and work to create the possibility of love in the lives of others. This is what we try to do at Catholic Worker Hospitality House…we’re not always successful, but we keep on trying. Peter Stiehler is the director of Catholic Worker Hospitality House which he co-founded in 1996 with his wife Kate Chatfield. Peter and Kate live in Brisbane with their daughters, Ella and Mary.